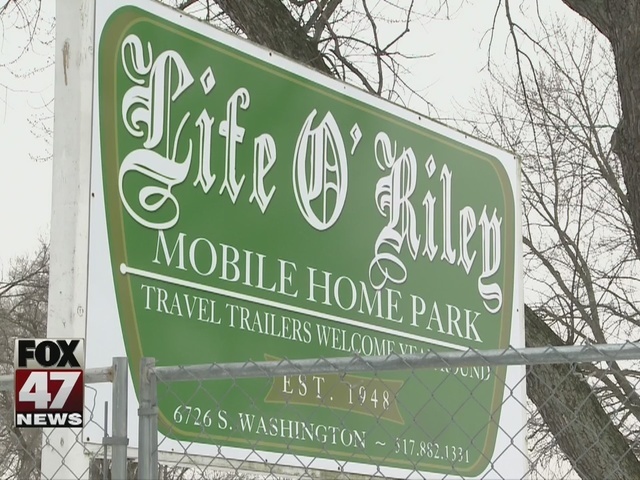 People who used to live in the Life O'Riley trailer park have moved on, but the mess left behind when they were forced to move has not. After nearly two years, neighbors are more than a little fed up. The abandoned trailer park as a neighbor is making it hard for Pat Ray and his wife to sell their house. "One man didn't even look at it. He come right out and told me 'I don't even want to go through the house. It's next to the trailer park,' " Ray said. His house has been on the market for more than two years, even though the couple keeps dropping the price. Ray says every month the park goes untouched, his property loses value. In the nearly two years since the park was condemned the owners have torn down two trailers, but not much else has been done to get the property back up to code. "Even when they do work it's maybe they'll come in at 10 a.m., work till evening and then they're out of there," Ray added. "Then next two weeks they don't come in at all." While the homes are falling apart, the city can't do anything about it until June. That's when the property owners run out of time to fix it themselves. "They can revoke their license if that trailer park is not brought up to state standards," said Lansing's Director of Planning and Neighborhood Bob Johnson. If the license is revoked the city can come in and clear the lot, but Johnson says the fix should be easy for the owners. "Remove them from the site, bring in new units and land them on the pads, hook them up to new services and they're in business. It's that easy," Johnson explained. "Our main goal right now is to make sure the units are secure." Johnson says the city checks on the property about once a month. Last year the city fined the owners almost $40,000 for failure to board-up the trailers. Johnson says the owners have also been cited for not cutting the grass and leaving trash out. Some neighbors like Stephanie Ross want the park cleaned up, but would rather see a community center across the street. "It wasn't good the way it was and it's even more depressing now," Ross said. "I want something nicer than this. The whole trailer park thing wasn't working." The Rays agree, they want something next door that will add value to the neighborhood. They just wish the owners moved as quickly as the tenants were forced to. "They gave em 10 days to move out -- they give him two years," Ray added.